Outstanding Crochet: How to make a beautiful purse with flower decoration. Free pattern. 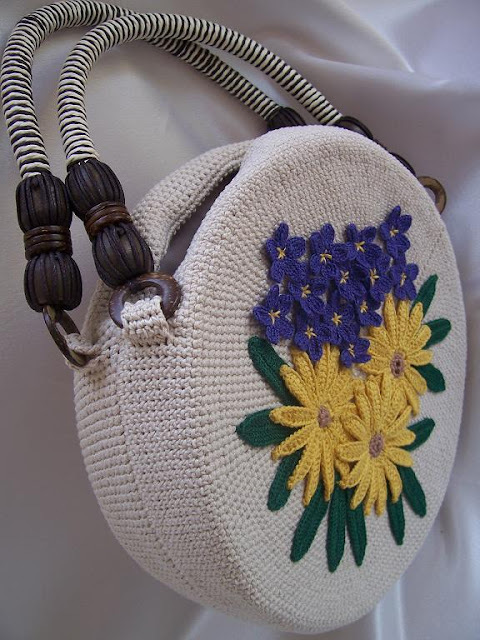 How to make a beautiful purse with flower decoration. Free pattern. My name is Natalia. I love to crochet and want to share my passion with you. I'm Russian, so I have to apologize for my broken English. I don't make boring things to decorate my house. If we can find some time to crochet we have to spend this time to make us look more stylish and beautiful (if more is possible, not sure). Let's make some things other women would kill for! Today I want to show purses I made and explain how to make one for yourself. I used plastic canvas inside to shape them. There are circle ones available in Jo Anne, but sizes are limited to two or so, at least in my local store. You also can get rectangular sheets and cut out 2 circles and 1 rectangle with a short side as a width of your purse and long one as a side of it, which connects those 2 circles. I stitched pieces of canvas using thread. I guess you can use fine wire as well, but if you wash you purse later on, it might develop rusty spots, so may be it's not a good idea. You'll also need #10 cotton thread (I used 2 threads at once and a hook 3 mm). I think you can take thread #5 as well, but I prefer #10 x 2 because it just looks so much better. 1 row: make 6 single crochet (sc) into this loop. 2 row: make 12 sc (2 sc in every sc). 3 row- until desired size of you purse; add 6sc (in every second sc, 4th row - in every third, 5th row in every 4th sc and so on). But be careful, make increasings every time in different sc, don't make them one above another so you purse remains circle, without any angles. As soon as you get desired size (make sure you have canvas corresponding size to make a frame), measure you peace to make canvas frame later), stop increasing, crochet until you reach 1/2 of desired width of your purse (1.5 inch in my case). Turn, crochet about 10 inch, turn again (this will become an opening). Keep crochet and turn until that peace reach 1.5 inch long, cast off. This peace you will fold under. Start again, making another circle, exactly the same. Then crochet them together, leaving opening. Then I crocheted some flowers and stitched them to the purses through canvas inside. You can buy some embellishment or flowers in the craft store to decorate you purse. I also made a lining inside to cover canvas. When the purse is ready, get a pair of matching handlers or crochet them. To attach handlers I made 4 little stripes, put them through rings at the end of handlers, folded them inside and stitched to the purse. So, are you ready to make a unique purse nobody else has? I guarantee women will stare at your purse and ask where you got it. You have plenty of time until summer to make yourself look outstanding! Какая необычная сумочка! понравилось третье фото. и не только сумка! Thank you! I have another one almost ready, bigger size, but haven't decided what kind of embellishment to make. It already took an year to think... Gosh, I am slow thinker. Если не для торжественных выходов, то я бы украсила вязаными шнурочками и морскими ракушками. I really love this beautiful purse, thank you so much for the free pattern. Natalia, What beautiful work you do. Could you tell me what size hook did you use? Hi Rhonda, I made some adjustments to the post. Thank you for pointing out I didn't mention thread and a hook I used. So it's cotton thread #10 X 2 (2 threads together) and 3 mm hook. Good luck! Natalia, this is truly an outstanding pattern and adorable purse. Thanks for sharing it! i hope that you are still on here so i can thank you for the pattern. it is just so beautiful...can't wait to crochet it. i am sure alot of women will be asking where i bought it. my passion is crocheting also...i always have at least 1 or more projects going at all times. again thank you so much for the pattern.